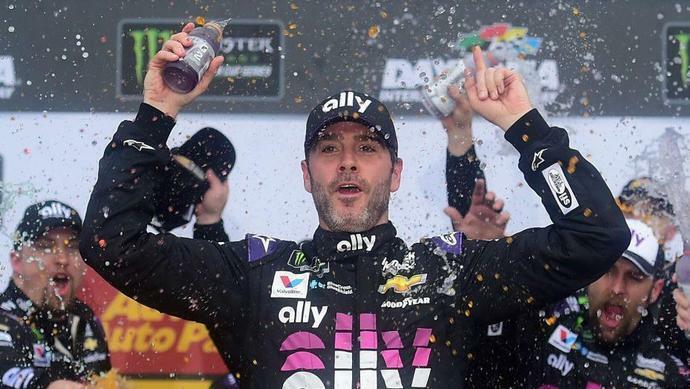 Jimmie Johnson: "I didn't try to crash Paul … it was a racing incident"
DAYTONA BEACH, Fla. - Remorse and rejoice intertwined within Jimmie Johnson on a rainy Sunday at Daytona International Speedway. Johnson's contact with leader Paul Menard triggered a 17-car crash in a 20-car field and put Johnson first just before rain ended the Advance Auto Parts Clash early. The victory was Johnson's first in NASCAR since his June 2017 win at Dover, but the focus afterward was about the contact with Menard's car. "When you drive into somebody and spin them out, you know what you did," Johnson said. "I pulled up alongside another car and a wreck started. I'll take whatever blame that is fairly and supposed to be put on me, but let's remember the rain is coming, it's literally the white flag and how many plate races have we seen there is aggressive driving to try to win the race? "That's simply what I was doing. I didn't try to crash Paul. I didn't drive through Paul. It was a racing incident, and I'm very remorseful. I'm probably more remorseful than any driver in the field when stuff like this happens. I don't crash people to win races. "I looked in the mirror and there were a lot of cars caught up in it. I hate that aspect of it. Absolutely, I'm remorseful, but at the same time, I've got a split-second decision to win a race and I set up the pass and got position on him clean. I don't know what triggered his car wobbling and the accident starting from there." "Definitely reach out to Paul and talk with him through what happened and take it from there," Johnson said. "I think a phone call goes much further than a text and it would be even better face-to-face, but I'm assuming he's gone. Certainly talk thought it. "I don't know if he or anyone else involved in the crash will care what I have to say. I've been in that position where I just didn't care, but I will definitely do my best to explain what I was thinking and what was going on and expect to hear his point of view as well." Menard's take on the incident? "Unfortunately, we just got turned there," he said. "I didn't really know what happened until I saw a replay. I felt like it was aggressive side-drafting. I got turned to the inside and hooked to the right and all hell broke loose." To the point of aggressive side-drafting, Johnson said: "I think we all aggressively side draft at these tracks. That's what we do. And absolutely that's what I did. That's how you pass, when you break the bumper cover, the plane of the bumper cover of the car you're going to pass or go by. So I guess, guilty." Runner-up Kurt Busch wondered about Johnson's action after the contact. Johnson went below the double yellow lines but NASCAR ruled there was no infraction because he was forced down there by the contact. Johnson's reaction to Busch's wondering about a possible penalty for that? "He wants the trophy," Johnson said. "I'd politic if I was him, too. Why not?" "She literally closes in prayer every single night with, "We need Daddy to win a race," or "Dear Lord, can Daddy win a race," Johnson said. "Granted, it's not a points win, but she's going to be a happy girl when I see her." And be one person he won't need to explain wha happened at the end of the race.